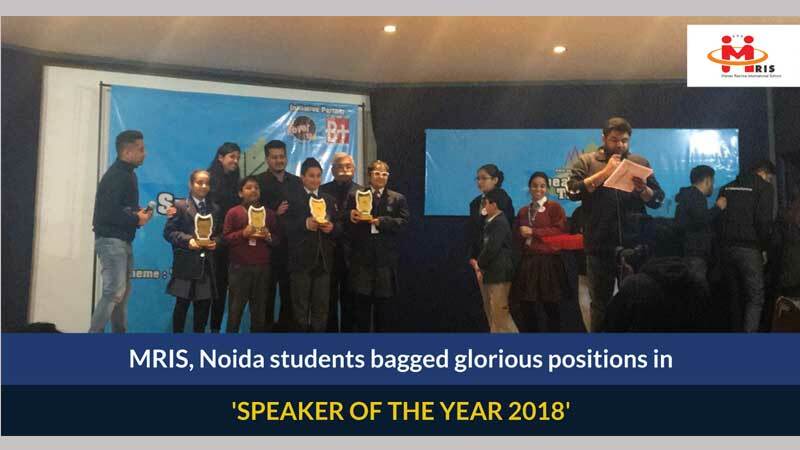 Seven students from MRIS-Noida participated in SOTY (Speaker of the Year) 2018 and bagged glorious positions. Anish Sharma of Grade VI bagged winner trophy in Junior Champ category, Nandini Goyal of Grade VIII bagged third position in High school Champ category, and Pritika Halder of Grade VII was conferred with a consolation prize. Atharv Bansal of Grade V was awarded for online posting. Anish Sharma has also been conferred with the ‘MV Speaker of the Year 2018’ award. More than 250 students from Delhi/ NCR participated in the competition. Deepa Malik (Padma Shri & Arjuna Awardee), Peepal Baba – the man responsible for planting 10 million trees all over India Radio Jockey, Ms. Stuti, Mr. Atul Mehtani (Famous Bollywood Choreographer), Army officers & some media personnel graced the occasion and encouraged the young innovators in their endeavors. Congratulations to the achievers and their parents! !